New to the Young At Art Museum is an exhibit devoted to Golden Age comic books. Called Zap! Pow! Bam! The Superhero: The Golden Age of Comic Books, 1938-1950, this is a traveling exhibit from the William Bremen Museum in Atlanta. 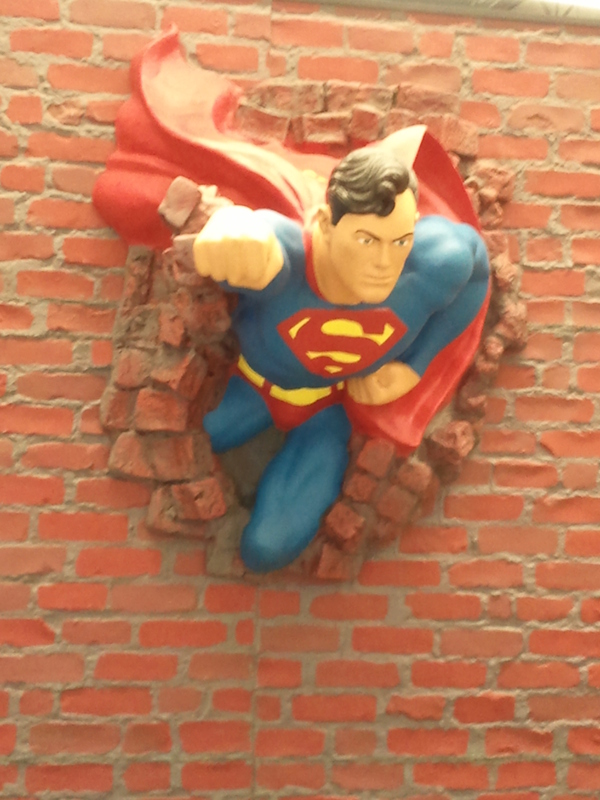 It’s located in The Knight Gallery and greeting visitors at the exhibit’s entrance is an arresting statue of Superman bursting through a wall. As its title suggests, the exhibit features many super rare comic books from the late ’30s through the early ’50s. Several of the titles star early DC and Timely (the company that eventually became Marvel) stalwarts like Superman, Batman, Wonder Woman, Captain America and Sub-Mariner. What was surprising about the comic books in the glass displays was how well preserved they were. One can only imagine their value based on their near mint condition. Any self-respecting comic book fan will enjoy examining them at his or her leisure. 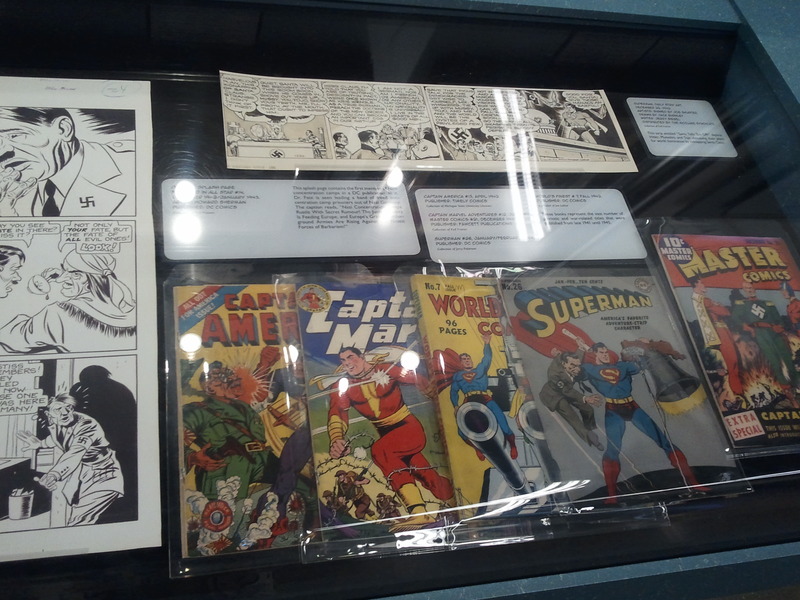 Accompanying the comic books are large black and white blowups of pages showcasing the artists’ expertise, as well as information about pop-culture in that era and creators like Jack Kirby. There are also opened trade paperbacks mounted on podiums that allow fans to read the stories in them. But this isn’t just a dry exhibit with old comic books in display cases. 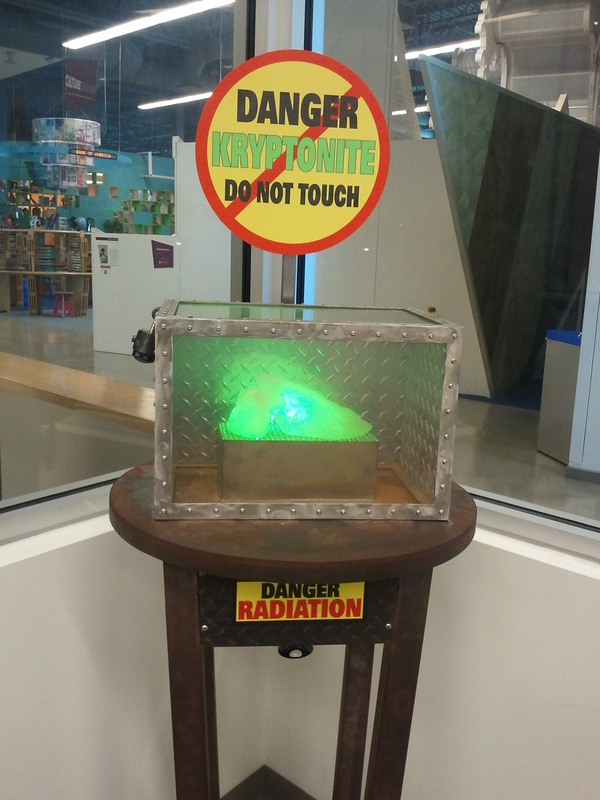 The exhibit also has memorabilia and superhero-related displays including a hunk of kryptonite encased in a glass case, and an old-style phone booth that must’ve been a convenient place for superheroes to change out of their civies. There is also a mini-theater that plays old Superman and Captain America serials and a drawing studio for tomorrow’s comic book artists. Another interesting feature about the exhibit is the mockup of a newstand that has–what else?–actual comic books. These are the modern-day ones given away during Free Comic Book Day. 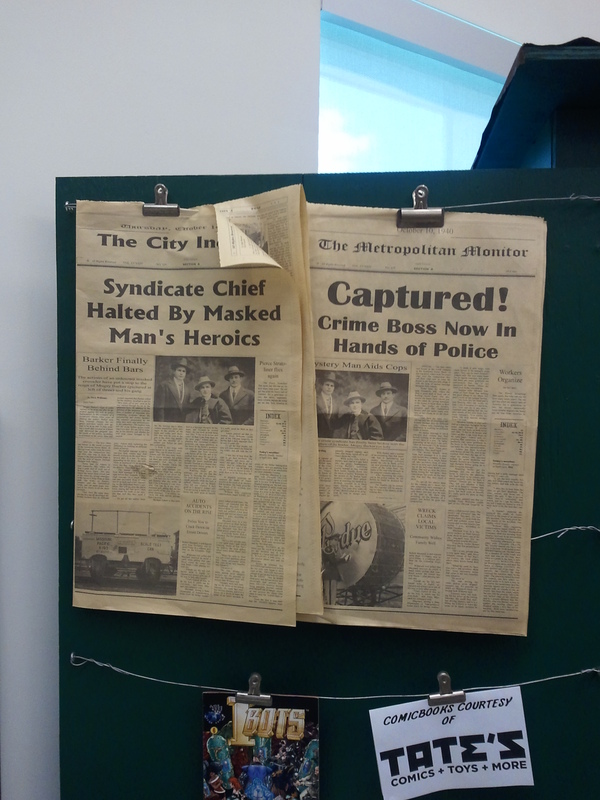 But a nice touch were the mockup newspapers with blaring headlines about superheroes and their feats that added a sense of realism and transported visitors back to that time period. It’s not a large exhibition, but serious fans should enjoy it and can spend up to an hour there just examining the displays and comic books. The exhibit is running at the Young At Art Museum (a children’s art museum) in Davie, Florida until January 5. There isn’t any word if an exhibit about Silver Age comic books is being planned. Maybe it’s something to be considered by curators. *Please check out our Facebook page for more photos of this exhibit.